The past always has a way with catching up with you. The same can be said for the Emerald Archer of Star City, Oliver Queen [Stephen Amell]. 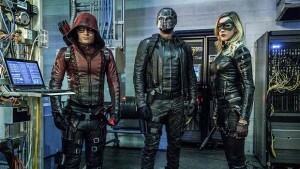 With the sudden return of Roy Harper [Colton Haynes] — also known as Arsenal, Oliver’s former sidekick — and the League of Assassins making their presence known once again, things are getting worse by the day for Star City. Combine that with an evil hacker known as “The Calculator” [Tom Amandes] seeking to wreak havoc, and Team Arrow has a lot more to deal with than just H.I.V.E. The team has their hands full with an extremely talented criminal, who was being blackmailed by The Calculator. After finally being caught, Oliver confronts the thief and unmasks him, revealing them to be Roy Harper – at long last reuniting the Green Arrow and Arsenal. Even if it was just for this week, seeing Roy back under the red hood was a welcomed sight. Last season, he turned himself in as the Green Arrow to get Oliver out of jail, after Oliver’s secret identity was almost compromised. Roy ended up faking his own death in the process, going on the run until the Calculator uncovered the truth regarding him and the Green Arrow. In this week’s episode, “Unchained,” Roy starts to be welcomed back into Team Arrow with open arms. When Roy reveals that The Calculator’s threatening to tell the world the true identity of the Green Arrow, however, any sentimentality in this reunion is thrown out the window. The Calculator plans on bringing Star City to its knees through a barrage of cyber attacks that will cripple every aspect of life in the city. From its power grids to its gas mains, Oliver decides that there is too much at risk to not stop him. Meanwhile, Team Arrow’s wheelchair-bound hacker Felicity Smoak [Emily Bett Rickards] exchanges virtual blows with the Calculator throughout the episode, finding a fitting equal for the newly-dubbed “Overwatch” to go up against. After putting an end to his plans, the Calculator isn’t caught. But to Felicity’s surprise, her estranged father reveals himself in the offices of Palmer Technologies – who, unknown to Felicity, is the Calculator. 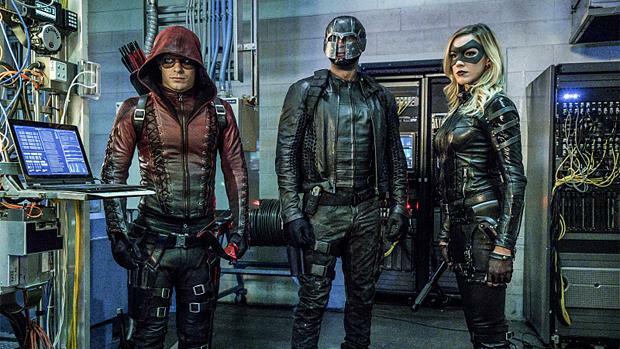 It seems as if the Calculator’s introduction is a distraction for Team Arrow; as far as the audience knows, the Calculator might be in league with the H.I.V.E. or Damien Darhk. It seems all too coincidental that the moment the team makes progress on tracking down Damien Darhk, that The Calculator shows up to throw off their plans. Meanwhile, Thea Queen’s [Willa Holland] well-being has come into serious question after this week’s installment. Since being revived last season in the Lazarus Pit, she has suffered intense moments of bloodlust as a side-effect of being brought back to life. After a run-in with Damien Darhk [Neal McDonough] that they had thought stopped her bloodlust, it is revealed that she will slowly die if she doesn’t give in to the killing urges. Thea’s state of mind can only raise concerns about the grave that was introduced earlier this season; who exactly is six feet under, and — most importantly, for Thea’s sake — who put them there? In Nanda Parbat — the home of the League of Assassins — Nyssa al Ghul [Katrina Law] seeks to take down Malcolm Merlyn [John Barrowman], who assumed leadership of the League after her father, Ra’s al Ghul [Matthew Nable], was killed by Oliver last season. It is here that they introduce “Lotus,” an elixir designed to counteract the negative effects of being brought back to life through use of the Lazarus Pit. After the major events of the episode, Nyssa then arrives in Star City with the Lotus in tow, presenting a proposition to Oliver – kill Malcolm Merlyn to save Thea’s life. This deal might make or break the remaining members of Team Arrow, having already dealt with close friends and family dying before. Despite the guilt, the plan is still risky at best; if he kills Malcolm Merlyn, who’s to say that the Lotus will even save Thea? Looking ahead at the next few episodes, Oliver’s guilt might end up being the downfall of them all. For the rest of the season, it’s very possible that Nyssa al Ghul and Malcolm Merlyn will play an integral part in the lives of the remaining members of the Queen Family. Still, there are questions that need to be answered: What if Oliver fails in his duel against Merlyn and his efforts to save his sister were fruitless? If the Emerald Archer doesn’t succeed, what darkness will fall upon Star City? Most importantly, the Lotus is said to counteract the effects of the Lazarus Pit; but what if it reverses the life-giving effects of the Pit and ultimately costs Oliver the only family member he has left?